Timed games may seem daunting initially, but I’ve been playing in them for years now and there are various strategies to save time. Here’s my thoughts on the Clocks of War! First up, playing fast doesn’t mean you can’t have a laugh with your opponent, makes sure you do! Rather it’s all about having a plan in advance. 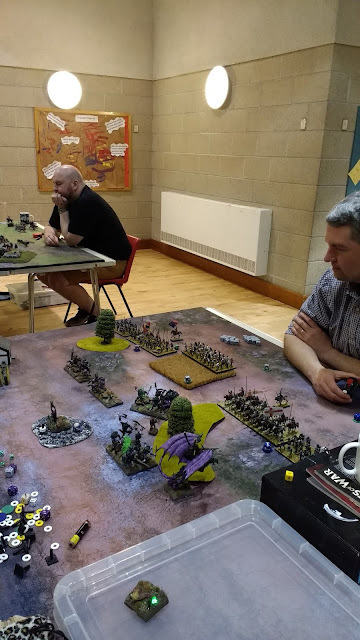 I’ve lost count of the number of times I’ll be standing at the table and my opponent will say, “hmm I’ve not really thought about where I’m putting which units” This is bound to end badly… When I build an army, I will design not only the combat groups but also a general battlefield deployment. This is super important as that way when you arrive at the table you’ll know what goes where, and your battle plan will be forefront in your mind. So the central section is fast and shooty, it can redeploy during the battle as needed, the flank force can go on either flank with an intention of pure annihilation. I will decide before I deploy any units which flank I’m going for, however by deploying the central section first it keeps my opponent guessing. Ok before you actually deploy, put some dice on the battlefield at the 12” line, so you know how far in you can deploy. Pick up your first unit, ask your opponent if they are ready (don’t rush them), once they are, start the clock and drop that unit. This should only take a few seconds, then while your opponent is deploying their unit, pick up the next one and have it ready. As soon as they are done, drop yours, press the button. Keep doing this until complete. My entire deployment usually takes less than 1 minute. My opponents usually take 3-5 mins, it doesn’t sound like a lot, but it all helps! I don’t pay a huge amount of attention to my opponents deployment, I don’t ignore it completely but it’s more important to keep to your design otherwise the army won’t work correctly, stick with your strategy! 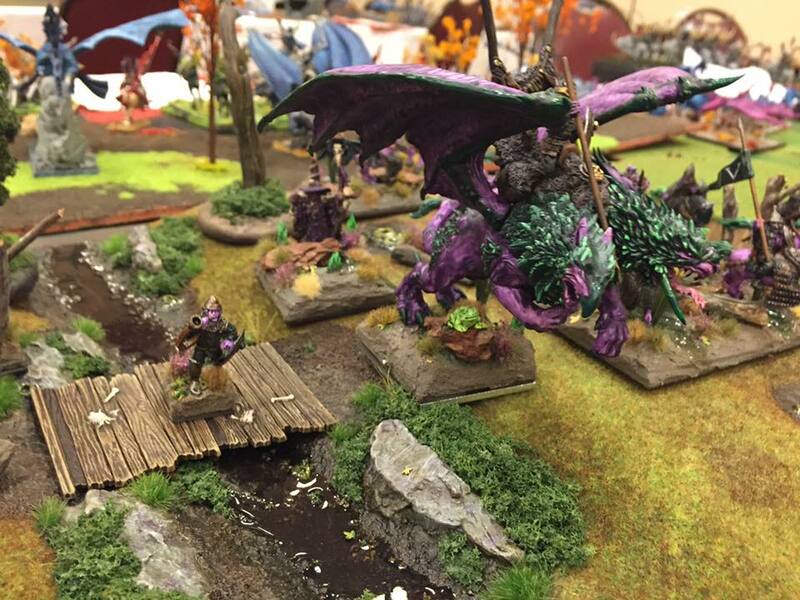 That being said I will sometimes save a floating unit till last such as a Dragon, and this I’ll place this down to take advantage of any mistakes my opponent has made in deployment. Ok so we have a time advantage, how do we keep it? Be precise with your movements, check you aren’t giving away flanks etc but don’t over analyse. If you spend too long thinking about possibilities you will time out. The key thing here, is to use your opponents turn to think about what you want to do in yours! As they move a unit, consider ok on my turn I will move my unit there or I will charge them etc. By planning in advance you can quickly get things into place. Have a set number of dice in different colours, and sort them on your opponents turn, you know you will be charging and need 18 dice? Get them ready in advance! Rules debate? Ok these are rare in KoW but can happen, pause the clock. If your opponent has overbearing force in a melee, I will let them roll for double 1’s, and typically again they do the same to me. That being said if your opponent does want you to roll that melee out, that is absolutely fine, never get salty over this as it is simply following the rules. Ok we’ve done all these things and time is getting low, what do I do? Don’t panic! Use what time you have wisely. If you have 1 minute left do not charge a Zombie legion into the rear of an enemy unit! Again you should be using your opponents turn for thinking about strategy and dice prep etc. Just do the things you time for, and preferably the actions that are most likely to win you a game! I recall one game I won, simply by moving an ASB up and blocking a horde from getting into a dominate circle, if I’d done nothing else that turn it wouldn’t have mattered that was the one key action. One last word for new players, and those who are especially worried about clocks and pressure and such. Don’t worry, just take things easy. It’s all a game we are playing for a laugh! If you do run low on time, as above just do the important stuff. You should never actually time out providing you stick to this. Just play the game, have fun and it’s all good!